AB de Villiers hammered Ashok Dinda to all parts of the Subrata Roy Sahara Stadium in Pune to score 26 runs from the final over of the innings. Poor Dinda came under De Villiers' wrath as he hit the ordinary-looking pacer for 6, 4, 6, 4, 4 and two runs to end the innings on a high as Royal Challengers Bangalore posted a huge 187 for three in 20 overs. 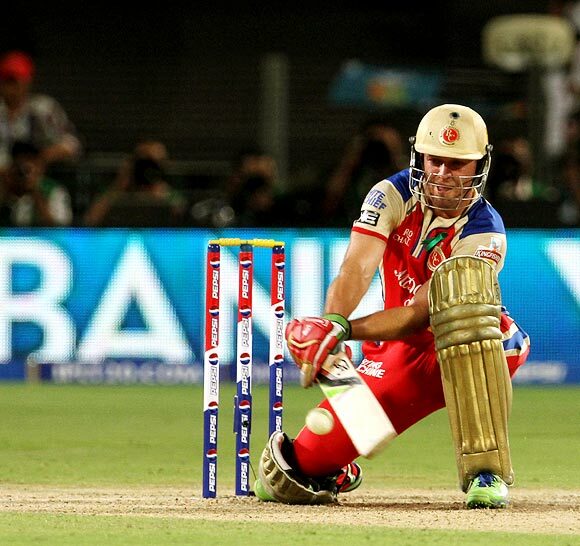 Royal Challengers Bangalore won by 17 runs to consolidate their second position in the Pepsi Indian Premier League. RCB did not have the best of starts as Chris Gayle and Saurabh Tiwary found the going tough against Pune's disciplined opening attack. Gayle, who scored a majestic beaten 175 against the same opponent in the last meeting between both the sides, looked a pale shadow of himself as he managed just 21 off 21 deliveries. 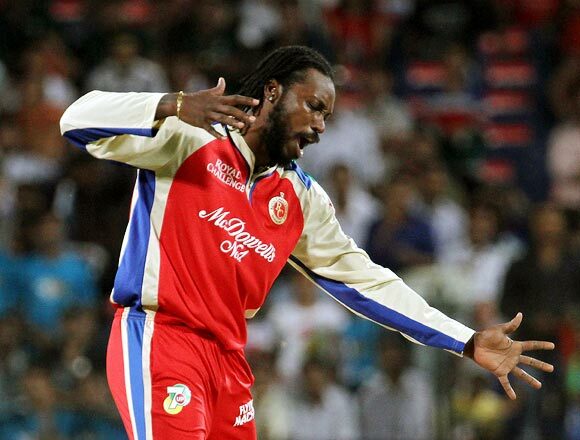 Part-timer T Suman claimed the wicket of Gayle in the seventh over of the innings who was caught by Bhuvneshwar Kumar. 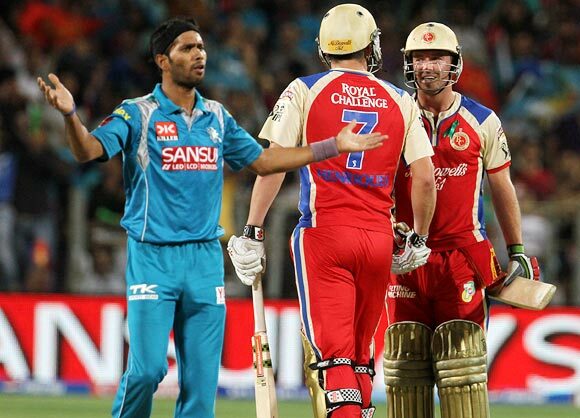 Saurabh Tiwary, promoted to open the innings, made most of the opportunity with a fluent half-century. The left-hander hit 52 from 45 balls, having hit two fours and as many sixes before he was caught by Rahul Sharma off Ashok Dinda. Skipper Virat Kohli played a 18-ball 25-run cameo and together with Tiwary added 63 runs for the second wicket off just 39 balls to give the much-needed impetus to RCB's innings. Dinda suffered in his final over to finish with horror figures of two for 52 in four overs. AB de Villiers took the Pune bowlers for a leatherhunt and scored his 50 off just 23 balls with the help of six boundaries and two sixes to power RCB to 187 for three. In Moises Henriques (27 off 13), De Villiers found an able partner. 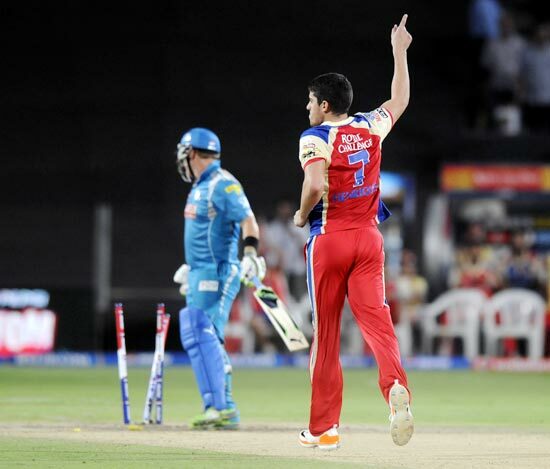 The duo smacked took the Pune bowlers for a task and shared unbeaten 68 runs for the fourth wicket in just 4.5 overs. Pune Warriors lost an early wicket when captain Aaron Finch was bowled by Moises Henriques for 15, in the third over of the innings. T Suman also failed with the bat and was run out for 11 as Pune found themselves in early trouble yet again. Robin Uthappa finally came good with the bat as he smashed a quickfire half-century. The Pune smashed his way to 75 from a mere 45 balls, hitting five fours and five sixes. But the rest of the batsmen failed to come to the party as Pune kept losing wickets at regular intervals. 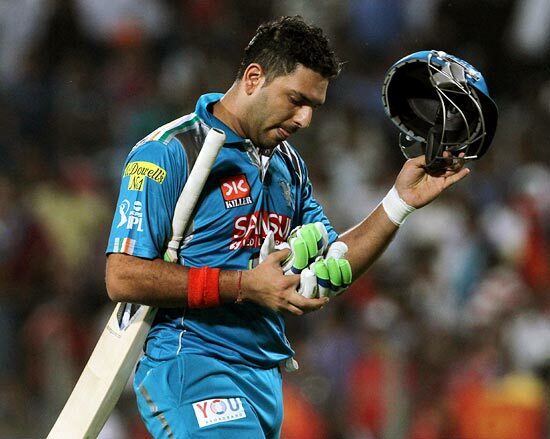 Yuvraj Singh failed with the bat yet again. He hit two sixes to score 16 before he holed out to de Villiers off Vinay Kumar, in the 11th over. 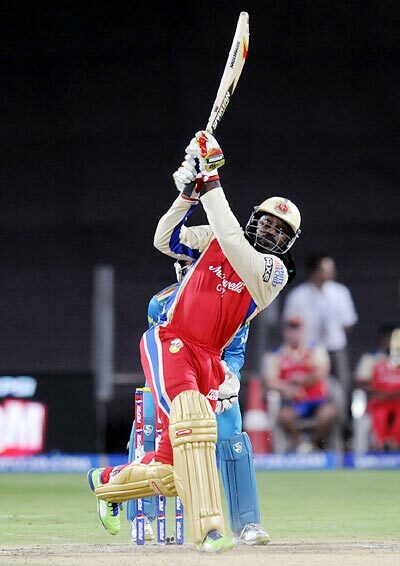 Chris Gayle claimed the wicket of Ajantha Mendis in the final over as Pune finished on 170 for nine in their 20 overs. This was Bangalore's first victory away from home as they inched closer to the play-off berths, with seven victories from 11 games. On the other hand, Pune are perched firmly at the bottom with two wins from 11 games.